Ann and Jeff VanderMeer’s The Weird is a monumental book in more ways than one. To begin with, there’s the sheer size of it: at 1,152 pages that feature 110 stories (quite a few of them novellas and short novels) amounting to three-quarters of a million words, it is probably the largest single volume of fantastic fiction ever assembled. Then, there’s the book’s – actually, the editors’ – ambition: to provide, through its contents, a comprehensive definition of the weird – a type of fiction that can provoke both terror and wonder by ‘‘expressing our own dissatisfaction with, and uncertainty about, reality,’’ and which has endured ‘‘contamination… by the influence of other traditions, some only peripherally connected to the fantastic.’’ Perhaps even more monumental, the book succeeds magnificently at what it sets out to do, conveying a sense of the weird in fiction through such a variety of voices, themes, and approaches that it virtually explodes the definition that it purports to establish through examples. Anyone well-read in supernatural fiction will be familiar with about half of the book’s contents. It’s the other half that is all the more remarkable and that supports the editors’ contention that the weird is an impulse in fiction that transcends time and geographic locale. Works from more than twenty countries are featured, including India, Japan, Benin, Antigua and Barbuda, Argentina, Guatemala, and Iran. The book’s nearest equivalents are Alberto Manguel’s two hefty anthologies Black Water (1983) and Black Water 2 (1990), both of which featured many works of macabre fiction in translation. A significant difference is that the VanderMeers have organized their contents in chronological order of publication. Read in sequence, the stories yield an astonishing ‘‘fossil record,’’ whose more anomalous fragments, which might seem mutant offshoots when studied out of this context, instead suggest an organism of astonishing diversity and complexity. Stories with fantasmagoric elements by Rabindranath Tagore (‘‘The Hungry Stones’’), Luigi Ugolini (‘‘The Vegetable Man’’), and Ryunosuke Akutagawa (‘‘The Hell Screen’’) abut works by A. Merritt (‘‘The People of the Pit’’) and Francis Stevens (‘‘Unseen – Unfeared’’) that kick-started the American pulp fantasy tradition. Allegorical fiction by Franz Kafka (‘‘In the Penal Colony’’) and surrealist fantasy by Bruno Schulz (‘‘The Sanatorium Under the Sign of the Hourglass’’) bracket the decade in which H.P. Lovecraft (‘‘The Dunwich Horror’’), Clark Ashton Smith (‘‘Genius Loci’’), and other Weird Tales writers were constructing the Cthulhu Mythos. Jorge Luis Borges (‘‘The Aleph’’), Amos Tutuola (‘‘The Complete Gentleman’’), and Julio Cortazar (‘‘Axolotl’’) were crafting Escher-esque fantasies at about the same time that Ray Bradbury (‘‘The Crowd’’), Shirley Jackson (‘‘The Summer People’’), and Charles Beaumont (‘‘The Howling Man’’) were perfecting the Twilight Zone-type of weird tale. Most readers are familiar, at least subliminally, with the time periods in which these authors wrote, but seeing these juxtapositions of vastly different works within the same interval is a little like the effect you experience at the end of a well-told weird tale, where disparate clues and portents all come together in a thunderclap of revelation. These juxtapositions reveal one other trait of the weird that is most noticeable in work from the first half of the 20th century: for the most part, the rules governing weird-fiction writing in non-English-speaking countries were different from those in America and England. Most English-speaking writers conjured the weird by depicting the eruption of the inexplicable into meticulously ordered realities based on the world outside of their fictions. The same cannot be said for the works in translation, many of which represent cultures whose fiction is rich with folklore and mythology or that resists the impulse toward rationalism and realism characteristic of western writing. Hagiwara Sakutaro, in his story ‘‘The Town of Cats’’, aptly sums up his narrator’s experience of a town that metamorphoses before his eyes when he writes, ‘‘An entirely separate world had appeared, almost as if a playing card had been turned over to reveal its other side.’’ In some stories, it is enough for the writer to quickly flip that card to let the reader know that that other worlds exists. Other stories unfold from start to finish in that world on the flipside of the card, with no hint of a world of more rationally ordered reality. These differences between Western and non-Western and English-speaking and non-English-speaking stories become appreciably less noticeable as the selections reach the later decades of the twentieth century, suggesting the increasing familiarity of fantasy writers with works outside of their own cultures. 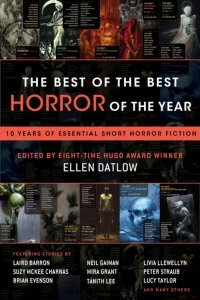 Most of the writers whom one would expect to be represented in an anthology of this scope are present, though there are a few noticeable absences – for instance, Arthur Machen, whom the VanderMeers feel wrote his best short fiction before 1900. Machen’s well-regarded tale, ‘‘The White People’’, was published in 1904, only four years before the book’s first selection, Alfred Kubin’s ‘‘The Other Side’’, and its reflections on ‘‘ecstasy’’ and ‘‘sin’’ in supernatural experience would have spoken very eloquently to the concepts underlying the weird. But perhaps this is a specious criticism, sort of like complaining that for dinner at El Bulli, you were served only 37 courses instead of 38. That’s an apt image to leave in the reader’s mind. This book is a true feast of fantastica, with abundant offerings so rich and delectable that they deserve to be savored over time. Ann & Jeff VanderMeer, eds. Tor 978-0-7653-3360-9, $39.99, 1,152pp, hc) May 2012.